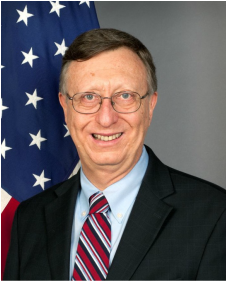 Ambassador Mark L. Asquino recently retired from the U.S. Foreign Service after a three decades plus career that included postings in Latin America, Europe, Central Asia and Africa. During 2012-2015, he served as U.S. Ambassador to the Republic of Equatorial Guinea, the third largest oil and gas producer in Sub-Saharan Africa. He previously was Deputy Chief of Mission in Khartoum, Sudan, another major oil producing nation. In Washington, he was Chief of Staff in the Office of the Under Secretary for Civilian Security, Democracy, and Human Rights at the U.S. Department of State. From 2010 to 2011, he had an academic year detail from State as the Senior Public Diplomacy Fellow at George Washington University. Earlier in his career he was Deputy Coordinator in State's Office for Reconstruction and Stabilization, Deputy Chief of Mission in Kazakhstan an public diplomacy officer in Uzbekistan, Chile, Romania, Spain, Panama and Venezuela. Prior to entering the Foreign Service, Ambassador Asquino spent a year as a Fulbright Lecturer in American Studies at the University of Oviedo, in Asturias, Spain. Ambassador Asquino earned a Ph.D. in American Civilization from Brown University, where he also did his undergraduate studies. His wife, Jane Asquino, is a former Peace Corps volunteer.